MTV announced the VMA nominations Tuesday morning, and one Nicki Minaj was not feeling them. While her “Anaconda” got nods for Best Female Video and Best Hip-Hop Video, she felt the work deserved a spot in the top category, Video of the Year, as well as Choreography and others. Her other video, “Feeling Myself,” was shut out completely. Minaj whipped up a Twitter storm, pointing out how the music video for “Anaconda” was basically all anyone could talk about last fall, and saying that if she were a different “kind” of artist, it would have gotten more nominations. What began as an exchange between Minaj and Swift rapidly expanded to include Ryan Seacrest, Kim Kardashian, and of course, Katy Perry. But the crisis was quickly averted! Ryan posted a headline of Taylor saying she loves & supports me. But not me saying the same to her. Lol. Their headline says I took a "jab"? 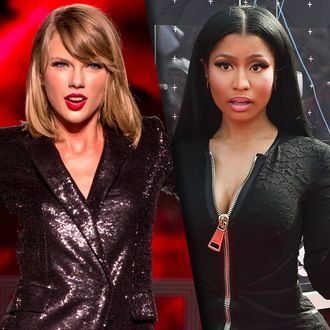 Entertainment Weekly got caught in the crossfires when it juxtaposed a glamour shot of Swift with a bug-eyed one of Minaj. It eventually issued an apology and changed the photo. And this wouldn’t be a story about the Twitter vortex if it didn’t include Kim Kardashian. As all of this was going on, Kim Kardashian was lounging around in Paris and tweeted this photo with the (now deleted) caption, “Imma let you finish” — a reference, of course, to her husband’s infamous interruption of Taylor Swift. She can’t even be bothered with the music world right now, you guys! And that, kids, is how “Bad Blood Pt. 2” was written. UPDATE: Swift has officially apologized (on Twitter, of course) for missing the point. Minaj has accepted the apology, but not before giving a little shout-out to Katy Perry.